All India Granite and Stone Association (AIGSA) has approached the Indian government demanding free import of granite and marble blocks. Presently Central government has put total restriction on import of granite blocks while import of marble blocks is allowed only upto six lakh tonnes. This policy is hampering the growth of the industry, said J.B. Surana, President, AIGSA. He further stated that India, though a major exporter of granite marble and other stones, exporting to the tune of Rs. 9,000 crores per annum, restrictions on import are creating hurdles in the industry's growth. About 20,000 units are linked with the Indian stone industry. 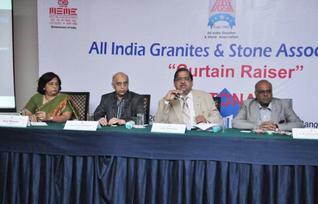 To make the Indian stone industry grow import of marble and granite blocks need to be brought under Open General License (OGL) so that sufficient quantity of the raw material is available, said J.B. Surana. He further said import of finished stone products should be restricted by fixing the floor price to protect the domestic units.